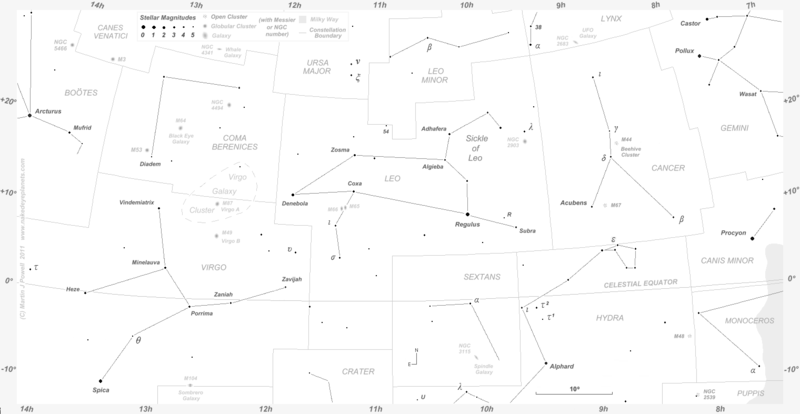 Star map showing the region of the night sky around the constellations Cancer, Leo and Virgo (click on the image for a full-size version). The star map applies to observers in the Northern hemisphere (i.e. North is up); Southern hemisphere observers should invert the map (South up) to obtain a correct orientation. 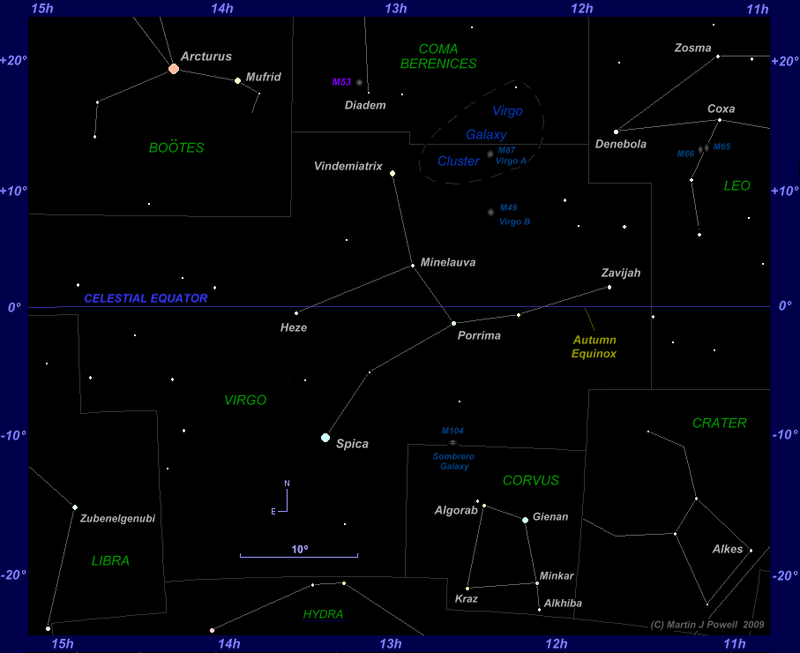 Constellations to the East and South of Virgo are shown in a separate star map below. The faintest stars on the map have an apparent magnitude of about +4.8. A printer-friendly version of this map is available here. Co-ordinates of Right Ascension (astronomical longitude) and Declination (astronomical latitude) are marked around the border of the chart. Also included on the star map are numerous deep-sky objects (objects beyond our Solar System) which can be seen through binoculars and small telescopes; these are detailed in the main text below. This article describes the brighter stars and deep-sky objects in the constellations Cancer, Leo, Virgo and their surrounding constellations (covering the region of the zodiacal band from Right Ascension = 8 hours through to 14 hours). All of the brighter stars can be seen with the naked-eye under clear, dark skies, however most of the deep-sky objects require the assistance of binoculars and/or small telescopes. The fascinating origins and mythologies lying behind the zodiacal constellations will also be discussed. Alphard ( Hya or Alpha Hydrae, mag. +2.0), a pale orange red giant star in Hydra, the Water Snake. Arcturus in Boötes (pronounced 'Boe-OH-teez') is the brightest star in the Northern celestial hemisphere and the fourth brightest star in the sky. It can easily be found from the curving 'handle stars' of the Big Dipper (or Plough) asterism in Ursa Major (see diagram at lower right). Arcturus has a noticeable orange colour to the naked eye (more evident in binoculars) since this star is a red giant; it is some 27 times larger than our Sun and is 34 light years distant (where 1 light year = 63,240 Astronomical Units). The name Arcturus is ancient Greek for 'bearkeeper', since Boötes was originally depicted as a herdsman driving the big and little bears (Ursa Major and Ursa Minor) around the sky and holding the leash of Canes Venatici, the Hunting Dogs. Cancer, the Crab, is a faint and small constellation but it contains numerous interesting objects for the telescopic and binocular observer. With no star brighter than magnitude +3.5, it is the faintest constellation of the zodiac and therefore the most difficult to see. Observers in urban and suburban locations - where the limiting magnitude (the faintest stars visible at the observer's zenith) may only be around +4.0 - are likely to have problems viewing the constellation without optical assistance. 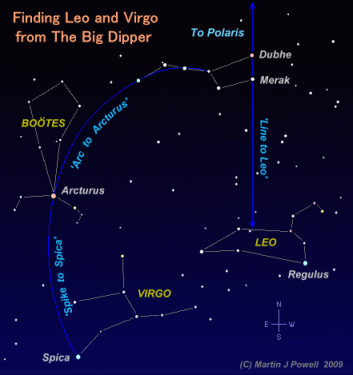 Diagram showing a simple method of finding Boötes, Leo and Virgo using the 'Big Dipper' (or 'Plough') asterism in Ursa Major (an animated version can be seen here). The constellation's association with a crab comes from Babylonia, however, like several other zodiac constellations, its origin may be much older. On Egyptian zodiac diagrams (ca. 2800 BC) it appears that the two Aselli (i.e. the stars Asellus Borealis and Asellus Australis - see below) are named the 'Two Turtles', possibly referring to river-turtles which are commonly found both in the Nile and around Asia Minor. The turtle, like the crab, is a hard-shelled aquatic creature, and the constellation's association with a 'hard-shelled creature' became established across the Middle East and as far afield as China, where the constellation became known as 'The Tortoise'. To the Babylonians it was known as 'al.lul' (possibly meaning 'Crab'), one of their eighteen zodiac constellations and mentioned in their cuneiform tablets known as The 36 Stars (ca. 1100 BC) and MUL.APIN (ca. 1000 BC). The Praesepe star cluster within the constellation (see below) was later known as 'Kushu' (a 'water-animal'). The Persians (ca. 550 BC to 330 BC) called it 'Kalakang' ('Crab') and mentioned it as such in the Bundahishn, the Zoroastrian story of Creation. The Arabs named the constellation 'Al Sarat n', 'the Crab'. Today the crab's most prominent morphological feature retains an Arabic name, albeit derived from the words 'Al Zuban h' ('the Claws') - what we now call Acubens. The star marks the crab's Southern claw, its Northern equivalent ( Cnc or Beta Cancri, mag. +3.5) carrying no historical name. The myth most associated with Cancer comes from ancient Greece (ca. 3rd century BC), where the constellation was known as 'Karkinos' (the 'Crab') and marked where the Sun was positioned at the summer solstice. The story behind 'the Crab' is popularly known as the second of the twelve 'Labours of Hercules', attributed to the Greek poet Peisander and dated to ca. 600 BC. 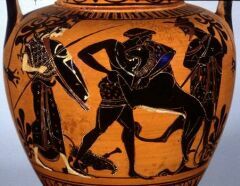 Whilst wrestling with the Hydra, the multi-headed water monster, the mighty hero Heracles (translated by the Romans as Hercules) is attacked by the crab in question. The crab has been sent by Hera, goddess of women and marriage (whose Roman equivalent was Juno), in order to distract Heracles and thus protect the Hydra. However, Heracles easily crushes the crab underfoot and subsequently slains the Hydra. As a reward for his efforts, Hera places the crab in the night sky, where we see it today. The zodiacal symbol (also known as a glyph or a sigla) for Cancer ( ) is one of a handful of zodiac symbols for which it may be possible to trace an origin back to ancient Egyptian times. Another 'hard-shelled creature' commonly found in Egypt is the scarab beetle, and it took its place among the stars of ancient Egypt in the position of Cancer. The scarab beetle's heiroglyph ( ) is well-known to both Egyptologists and the public alike, and does not bear much resemblance to the modern-day symbol for Cancer. However, in the 1940s science historian and writer Professor Otto Neugebauer studied two Egyptian texts which, although dating from the early centuries AD, cast much light on the ancient Egyptian's perceptions of the movements of the naked-eye planets amongst the zodiac constellations. One of them, a large and damaged papyrus, is held in a Berlin museum and is known as the 'Berlin Papyrus 8279'. The other, held in a Liverpool museum, comprises four thin wooden tablets coated with white plaster, which are known collectively as the 'Stobart Tablets' after its discoverer, the Reverend H. Stobart. Both are written in the Demotic script, a style distinct from heiroglyphic which followed the Late Egyptian script but which preceded Coptic script. In the Berlin Papyrus the scarab symbol is depicted as whilst in the Stobart Tablets it is depicted as which, with a little imagination, seem a little closer to our modern-day glyph. Cancer's five brightest stars form a shape reminiscent of the Greek letter lambda in lower case ( ). The aforementioned Acubens ( Cnc or Alpha Cancri), positioned at the South-eastern end of the constellation, is the fourth-brightest star in the constellation ( Cancri being the brightest, at mag. +3.5). To the naked-eye, Acubens appears as a star of magnitude +4.3, but a small telescope of aperture 75 mm (3 in) or greater will reveal a faint 12th-magnitude companion (Alpha Cancri B) about 11" away (i.e. 11 arcseconds, where 1 arcsecond = 1/3600th of a degree). Acubens (Alpha Cancri A) is itself a double star, its companion being just 0".1 distant - much too close for amateur telescopes to resolve. Alpha Cancri B is also double, making this a quadruple star system. The fainter pair are thought to orbit the primary pair every 6,000 years or so. The Acubens system lies at a distance of about 175 light years from Earth, which means that light from the star takes 175 years to reach the Earth. The star Iota Cancri ( Cnc) is a nice double star of magnitudes +4.0 and +6.5, separated by a relatively wide 30".5, making the two components just visible in 10x50 binoculars and easily seen through telescopes. Situated about 300 light years away, the brighter star is a golden-yellow giant and the fainter star (positioned to the North-west of the primary) is blue-white - a pretty combination when seen through telescopes. Cancer contains two interesting open star clusters, i.e. groups of young stars within our galaxy which have been formed from the same nebulous cloud. Messier 44 (or NGC 2632) is known as Praesepe or 'The Beehive Cluster' because of its binocular resemblance to a cloud of swarming bees. It is visible to the naked eye as a hazy patch of light at the constellation's centre but is much better seen through binoculars and telescopes. It lies at a distance of about 520 light years and is thought to be about 650 million years old. Binoculars show around 50 stars contained in a field of view roughly 80' across (i.e. 80 arcminutes, where 1 arcminute = 1/60th of a degree). Small to medium-sized telescopes reveal about 75 stars visible down to about magnitude 12, whilst large telescopes show around 300 stars down to 17th magnitude. Because of Praesepe's large area (it is 95' across) telescopes need to be fitted with wide-field eyepieces in order to appreciate the full splendor of this cluster. Praesepe is positioned a short distance North of the ecliptic (the apparent path of the Sun, which the Moon and planets follow very closely), so the planets regularly pass across it in rather spectacular fashion. Mars often crosses Praesepe, its orange-red coloration making a pretty sight against the cluster when seen through binoculars. Praesepe is flanked by the stars Asellus Borealis ( Cancri, mag. +4.7) and Asellus Australis ( Cancri, mag. +3.9), names which bizarrely mean 'northern donkey' and 'southern donkey' respectively. This probably relates to the fact that M44 is sometimes referred to as 'The Manger' in reference to the Nativity story; in this case the donkeys are considered to be feeding at the Manger. The name is rather preferable to that which was given to the cluster by the ancient Chinese: namely, the 'Exhalation of Piled-up Corpses'! 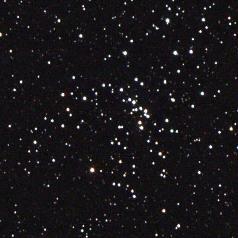 About 1°.7 to the West of Acubens is the open cluster M67 (NGC 2682). It is smaller and denser than M44 and is just beyond naked-eye visibility. There are over 300 stars in the cluster, which lies about 2,600 light years away. Binoculars show it as a small, hazy patch; small telescopes reveal about 20 stars down to 11th magnitude and medium-sized telescopes show around 50 stars down to 12th magnitude. With an estimated age of 5 billion years, this is one of the oldest known open star clusters, containing several red giant stars nearing the end of their lives. Leo, the Lion, is the fifth sign of the astrological zodiac and is one of the few whose figure in the night sky genuinely resembles the animal it is supposed to represent: a Westward-facing crouched lion. The Lion's head and 'mane' are an asterism of its six Westernmost stars commonly called the Sickle of Leo, which is shaped like a backward question-mark [ ]. At the base of the question-mark is Leo's brightest star, Regulus ( Leo), marking the position of the animal's heart (the star's alternative name is Cor Leonis, the Lion's heart). Regulus is a double star whose primary component (Regulus A) is magnitude +1.4, with a mag. +7.6 companion (Regulus B) lying some 177" (3 arcminutes) to its North-west. Regulus is another example of a multiple star system; Regulus A has a very close orbiting companion (not visible through amateur telescopes) whilst its fainter companion (Regulus B) is itself double, both of these stars (BC) orbiting the primary once every 130,000 years or so. Astronomers have determined that Regulus spins much faster than the Sun, with a rotation period of just 16 hours; were it to spin only 10% faster, it would break apart. This high rotation rate has deformed Regulus into an ellipsoidal shape. Regulus is the closest bright star to the ecliptic, lying about 0°.5 degrees away from it. One consequence of this is that the star is regularly passed by the Moon and planets, and they sometimes pass in front of it, causing it to blink out for a period of time (an event called an occultation). The fact that the name Regulus and the word 'Regal' are similar is no coincidence; Regulus is a Latin name meaning 'Little King'; it derives from the Babylonian word 'lugal' meaning 'king'. The name reflects an ancient belief that the star controlled the affairs of the heavens. It was given its current name in the sixteenth century by the famous Polish astronomer Nicolaus Copernicus. Although Leo's origins are normally considered to lie in the mythology of ancient Greece, where the constellation was known as 'Le n', it is certainly very much older, and probably one of the oldest zodiac constellations. The Egyptians referred to Regulus as the 'Lion's Head' in their list of 'hour-stars' which were used to mark the path of the Moon. The star Zosma ( Leo or Delta Leonis, mag. +2.6) was likewise known as 'His Tail'. Leo therefore most likely has an Egyptian origin, dating perhaps to the third millennium BC. Around 3200 BC Leo marked the summer solstice position, giving the constellation a particular significance amongst the Mesopotamians, whose artworks frequently depicted lions, bulls and scorpions in mythological contexts. Leo was known as 'The Lion' in numerous other cultures, including Arabic, Persian, Babylonian, Turkish and Hebrew. The Arabs knew it by the name 'Asad', the Persians by the name 'Ser' and the Babylonians called it 'ur.gu.la' ('Lion' or 'Great Dog'), one of their eighteen zodiac constellations. To the Babylonians it may have represented the lion which was often depicted on cylinder seals alongside Ishtar, their goddess of love. In the MUL.APIN tablets it is shown as Latarak, the Babylonian lion-headed protector-god. It is likely, however, that in the ancient Middle East the constellation of the Lion was much larger than the one we recognise today. For example, the Persian astronomer Al-Sufi, in his Book of Fixed Stars (964 AD), depicted it as the Bedouin Arabs had known it for many centuries: stretching from Spica (Virgo) all the way across to Castor (Gemini). For the ancient Greek story behind the Lion, we must return to the 'Labours of Hercules'. His First Labour, bestowed upon him by his cousin King Eurystheus, was to slay and bring back the skin of a lion which had been terrorising the region of Nemæa (in modern-day Corinthia, Greece). The lion had been taking women hostage in his cave lair in order to trap passing brave warriors who would attempt to rescue her. Whenever a warrior was close, the woman would turn into a lion and devour him, sending his bones to Hades, the god of the Underworld. After some wandering, Heracles finds the lion and first attempts to kill it by bow and arrow, only to find that the lion's body is impenetrable. Heracles entices the lion to return to its cave, which has two entrances. Heracles blocks one entrance and enters the other. He then stuns the lion with his club and, using his immense strength, chokes the lion to death. 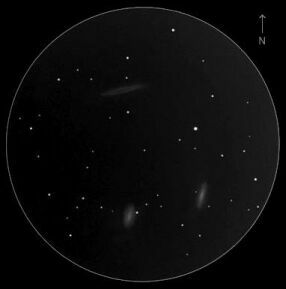 Galaxies in Leo A telescope observer's sketch of the galaxies M65 (lower right), M66 (lower left) and NGC 3628 (top). This gives a good impression of how galaxies appear through an astronomical telescope (Image: Michael Vlasov / ASOD). Mid-way along the lion's hind leg is the double star Leo (Iota Leonis). It comprises yellow-white components of magnitude +4.1 and +6.7, separated by about 2". The secondary component is currently positioned to the East of the primary and is slowly moving away from it, in a Northward direction. The orbital period is 186 years. Telescopes of 150 mm (6 in) aperture or larger will be able to split the pair. Several other double stars in Leo are beyond the ability of binoculars but are easily split in small- or medium-sized telescopes. Algieba (Arabic for 'the lion's mane'), also known as Gamma Leonis ( Leo) is one of the more impressive double stars in the night sky. The primary star has a magnitude of +2.3 and the secondary (mag. +3.5) is positioned 4".7 to the South-east of the primary. Both stars are orange-yellow giants, 126 light years distant from Earth, orbiting each other in a period of about 618 years. Binoculars also show an unrelated 5th-magnitude star (40 Leonis) close by. In 2009 astronomers discovered what they suspect to be a planet orbiting around the brighter star ( 1 Leonis). The measurements suggest a planet of around 8.7 Jupiter masses, orbiting the star in a period of about 430 days at a distance of 1.19 AU. Planets orbiting stars outside our Solar System are known as extrasolar planets (or exoplanets); as of early 2019, over 3800 such planets had been found. Close to Leo's Northern border with Leo Minor is another double star, 54 Leonis, whose components are magnitude +4.5 and +6.3. The fainter star is positioned 6".6 to the ESE of the brighter. One of the pursuits of many double star observers is tracking down those with significant colour contrasts. However, double star colours are usually very subtle - at the limits of the retina's colour-detection abilities - so that they often appear different for each observer. 54 Leonis is a case in point: it has been described as 'pale blue-green', 'banana yellow', 'greenish-white' and 'whiter than white'! Situated a little to the North of the lion's fore-leg is an interesting variable star named R Leonis. Its magnitude varies from +5.4 (visible with the naked-eye) to +10.9 (requiring optical aid) over a period of about 312 days. Considered to be one of the easiest variable stars to observe in the night sky, R Leonis is known as a Mira type variable (for more details on this star type, see the Aries-Taurus-Gemini page) meaning that it fluctuates in brightness over a long period. Mira-type stars are normally red giants, pulsating in the latter stages of their lives; indeed, R Leonis appears distinctly reddish when shining at maximum magnitude, distinguishing it from the stars around it. Future dates of the star's maxima, plus a star chart showing comparison stellar magnitudes, can be found on the Society for Popular Astronomy's website. Leo is home to many dozens of galaxies, although the vast majority are beyond the range of small telescopes. 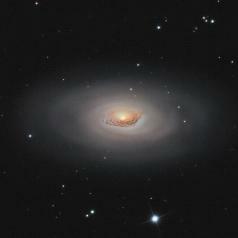 Two of the brighter examples are M65 or NGC 3623 (magnitude +9.5) and M66 (NGC 3627, mag. +8.8) which are positioned only 20' (0°.3) apart. They are not difficult to locate, being approximately mid-way between the stars Coxa ( Leonis, mag. +3.9) and Leonis. M65 and M66 are about 37 million light years away and they appear relatively bright and elliptical through small telescopes, both of them orientated in a North-South direction. They are just discernible through binoculars in dark, moonless skies as faint, circular hazy patches of light. Also worth tracking down in small telescopes is the relatively bright galaxy NGC 2903 (magnitude +8.9), positioned just to the West of the Sickle of Leo asterism and about 1°.5 South of the star Leo (Lambda Leonis, mag. +4.3). In a telescopic field of view, the galaxy forms a right-angled triangle with two 7th-magnitude stars. It has a bright central core and appears slightly asymmetric, orientated North-South. Occupying an area of 1,294 square degrees of the celestial sphere, Virgo, the Virgin, is the largest zodiac constellation and the second largest constellation in the entire night sky. The constellation's brightest star is Spica ( Vir), a blue-white star some 260 light years distant from Earth. It was recently found to be an eclipsing binary, meaning that it has a much smaller, fainter companion star orbiting around it (taking 4 days to do so). The companion star had previously eluded astronomers because the light drop caused whenever it passed in front of Spica was so small that it went undetected - until an Earth-orbiting satellite, built especially for the purpose, detected it. Star maps in recent centuries have often depicted Virgo as a young woman lying on her back with her head towards the West, holding a staff in her right hand and a sheaf of wheat or an ear of corn in her left hand (the name Spica is Latin for 'ear of wheat'). Celestial cartographers have often struggled to depict a human form amongst these stars, and in fact it appears that no civilisation ever saw the shape of a woman in this region of the sky. Rather, Virgo has always been associated with the harvest because, in ancient times, Spica's heliacal rising (its first appearance in the dawn sky after it had been out of view behind the Sun) took place around the commencement of harvest-time. The foodstuff harvested has mostly been assumed to have been grain or corn, although the name of the star Vindemiatrix ( Virginis or Epsilon Virginis, mag. +2.8), which is Latin for 'wine merchant', suggests an association with the grape harvest, at least in classical times. the thong of which stretches out over the tail of Leo." Assyrian farmers (ca. 7th century BC) marked the season of ploughing by the appearance of the full Moon in Taurus and the springing of the green corn was marked by the full Moon in Virgo. Today the full Moon in Virgo takes place in April but in the first millennium BC it took place in early March, and sometimes as early as February. This does not fit the Babylonian harvest, which began in May, nor the Assyrian, which took place in June, but it does fit the first appearance of the spring corn in February. The Babylonians referred to a constellation in this part of the sky as 'ab.sin', meaning the 'furrow', which does not suit harvest-time, however in ancient Egypt the harvest began at the evening rising of Spica, when the full Moon was in Virgo, which may be the source of the constellation's relationship with the 'ear of corn'. The goddess who holds the ear of corn was a Babylonian invention, Spica ('ab.sin') perhaps having been the ear of corn itself, or at least its ripest (and brightest) ear. Virgo Star map showing the surrounding constellations referred to in the main text (click on the image for a larger version and click here for a printer-friendly [black & white] version). In ancient Egypt there were several versions of the zodiac. The most famous of them is the circular zodiac of Denderah, dating from the 1st century BC but based on constellation patterns from much earlier times; it is now held in the Musée du Louvre in Paris. It depicts Virgo as the Nile-goddess Isis, holding an ear of corn. But Egypt was not the origin of the constellation of Virgo because the Egyptians had two enormous constellations in this region of the night sky: the 'Hippopotamus' and the 'Giant'. Incidentally, in Egypt the line joining Arcturus to Spica (which was known as the' Mooring-Peg') was the original 'starting point' of the zodiac. The astrological glyph representing Virgo ( ) is another of the zodiac symbols which may have an Egyptian origin. The Egyptian heiroglyphic equivalent was a seated woman ( ), its Demotic symbols (according to Professor Neugebauer) being depicted as (in the Berlin Papyrus) and (in the Stobart Tablets). Turned on their sides, the latter two symbols do bear some resemblance to our modern-day gylph. The ancient Greeks called the constellation 'Parthenos' ('Virgin'), a representation of the Greek goddess of the harvest, Demeter, or perhaps her daughter, Persephone. The Romans saw her as 'Core' ('Maiden'), representing their harvest-goddess Ceres, or perhaps her daughter, Prosperpina. The Arabs adopted the Greek name, calling it 'Al Adhr al Nath fah', 'the Innocent Maiden'. Other associations with 'the Virgin' have included Eirene (Greek goddess of peace), Diana (Roman goddess of the hunt), Ishtar (the Babylonian goddess of love) and, of course, the Virgin Mary. The star Porrima or Arich ( Vir or Gamma Virginis) is a double-star which has been of considerable interest to telescopic observers in recent years. It comprises two almost identical, creamy-white stars, both of similar magnitude (+3.5) which together appear to the naked-eye as a single star of mag. +2.9. The secondary star revolves around the primary star in a highly-elliptical orbit with a period of 169 years. For much of the twentieth century the two stars could easily be resolved in small telescopes, however the secondary star came very close to the primary (0".3) in 2005, making the two stars almost impossible to split, even in large-sized telescopes. They are now separating again and the two components should be discernible through large/medium-sized telescopes after 2012 and through small telescopes after about 2020. Positioned 6°.7 to the North-west of Spica is the double star Vir (Theta Virginis). Its two components ( Vir A and Vir B) are blue-white, of mags. +4.4 and +9.4, the B star being positioned 7".1 to the NNW of the A star. Theta Virginis A has a very close companion star (a spectroscopic binary) which orbits it in a period of about 14 years, but it is too close to be discerned through amateur telescopes. There is also a third component ( Vir C) of mag. +10.4 positioned 69" to the WNW of the A star. The Theta Virginis system is about 415 light years from Earth and is considered to be a good resolving test for a 75 mm (3 in) telescope. Near the left edge of the star chart, about 7°.1 to the ENE of the star Heze ( Vir or Zeta Virginis, mag. +3.4) is another double star, Vir (Tau Virginis). The brighter component is mag. +4.3 and the fainter (+9.6) is positioned 80" (1'.3) to the WNW. It is a difficult double for most binoculars but the two components are easily seen through small telescopes. The stars are located about 218 light years from Earth. Virgo contains few bright stars but it is home to many interesting galaxies. Situated in North-western Virgo, a short distance to the North-west of Vindemiatrix, is an area of the sky known to galaxy-hunters as the Virgo Galaxy Cluster. The central region of the cluster is marked on the star chart (it is sometimes called the Coma-Virgo Cluster, since it straddles the boundary with Coma Berenices, Berenice's Hair, to the North). Over 3,000 galaxies are contained in the cluster, which lies at a distance of about 50 million light years. Pioneering astronomer Edwin Hubble described the region as 'The Realm of the Nebulae' in the 1920s and was the first to suggest that they were not true nebulae (clouds of gas and dust) but they were in fact galaxies far beyond our own Milky Way galaxy. Virgo contains more bright galaxies than any other constellation in the night sky. Around thirty of them are visible in small telescopes but only a few of them are potentially within the reach of binoculars; these are shown on the star chart. 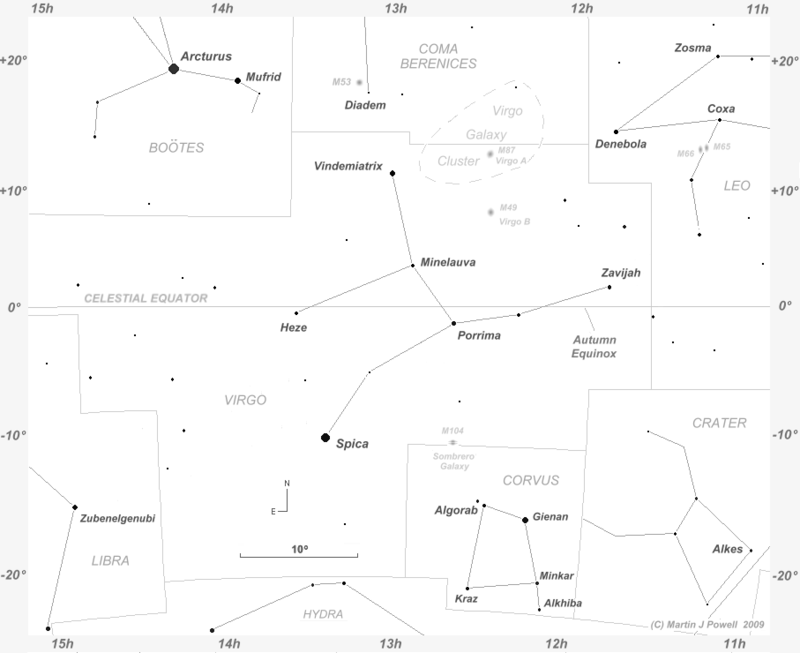 However the North-western region of Virgo contains no bright stars and finding one's way around this part of the sky can be difficult, even for the experienced amateur astronomer. 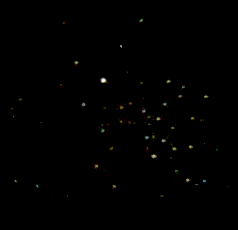 M49 (NGC 4472, mag. +8.4), also known as the Virgo B Galaxy, is the brightest of the Virgo galaxies, about 60 million light years distant. Under dark, moonless skies, binoculars reveal it as a faint, circular, fuzzy glow; telescopes will reveal its slightly elliptical shape. M87 (NGC 4486, mag. +8.6), the Virgo A Galaxy, is situated close to Virgo's Northern border with Coma Berenices, at the centre of the Virgo Cluster. Small telescopes show it as a circular 'fuzzball' with a bright, dense core; in binoculars it can be discerned as a faint, rounded glow. This galaxy is about the same size as our own Milky Way galaxy (about 120,000 light years across) but it contains many more stars - perhaps numbering several trillion! It is a strong radio and X-ray source which has been extensively studied by astronomers. Both M49 and M87 are classed as giant elliptical galaxies, thought to have been formed by the collision of spiral galaxies over the course of billions of years. 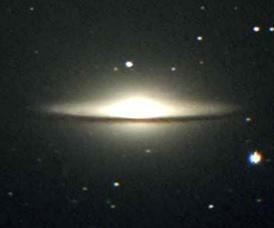 The most famous of the Virgo galaxies is the Sombrero Galaxy (M104 or NGC 4594), some 28 million light years distant, named after its resemblance to the Mexican hat. Situated close to the border with Corvus, the Crow, its approximate location can be found by constructing a right-angle between the stars Spica and Porrima. Long-exposure photographs taken through larger telescopes show an impressive galaxy positioned nearly edge-on to our line of sight, with an equatorial dust lane orientated East-West cutting across its central, bulging core. Small and medium-sized telescopes are required to see this feature; binoculars will only discern its central core as a small, faint, ghostly glow. The difficulty in viewing galaxies and nebulae through binoculars and small telescopes demonstrates an important point regarding the quoted apparent magnitudes of such deep-sky objects. The apparent magnitude of the Sombrero Galaxy is normally listed in astronomical catalogues at around +8.5 - potentially within easy reach of most binoculars - however this is a somewhat misleading figure because it refers to the magnitude the galaxy would have if it were a single point of light (i.e. like a star). This magnitude is referred to as the object's integrated magnitude. In reality a galaxy is an extended object (the Sombrero Galaxy is about 9' across and 4' high). As well as the integrated magnitude, some authors, when giving brightness values for objects such as galaxies and nebulae, also include the object's surface brightness, i.e. its apparent magnitude allowing for the fact that it is spread over an area of the sky (this is usually the magnitude per square arcminute). The surface brightness of the Sombrero Galaxy works out at about magnitude +12, which more accurately reflects its faintness in the sky - and explains why it is such a difficult object to see. Consequently, observers should not be disappointed if they fail to spot it, or any of the other galaxies mentioned in this article. Corvus, the Crow, is a small but distinctive keystone-shaped constellation positioned directly to the South of Virgo. For the telescopic user, its most interesting feature is probably the double-star named Algorab or Algorel ( Corvi, mag. +2.9). The binary comprises third-magnitude and eighth-magnitude stars, easily separable in small telescopes; the fainter star has sometimes been described as purplish in colour. Corvus' brightest star is Minkar ( Corvi, mag. +2.6); this is one of a number of examples of constellations whose brightest star has not been designated with the (technically correct) Greek letter alpha ( ), probably due to an error in interpretation or translation at some time in history. Indeed, Alkhiba (or Al Chiba), which carries the designation Corvi, is nearly 1½ magnitudes fainter than Minkar! Crater, the Cup, situated to the West of Corvus, contains little of interest to either the naked-eye or the telescopic observer; its brightest star Alkes ( Crateris) is magnitude +3.5. Sextans, the Sextant, has no stars brighter than magnitude +4.5 and city dwellers may not be able to see it at all without optical aid. Its most spectacular object is the Spindle Galaxy (NGC 3115), a short distance to the South of Leo. The integrated magnitude is +9.1 and the surface brightness is +12.6, bringing it within the range of 75 mm (3 in) aperture telescopes or larger. At higher magnifications it appears as a cigar-shaped haze, measuring 8' x 3' in a NE-SW orientation. The galaxy has a bright, elongated core which appears notably stellar in larger telescopes. Thirty-two million light years distant, astronomers class the Spindle Galaxy as a Type S(0) lenticular galaxy, seen edge-on. In 1992 a supermassive black hole was detected at its centre. 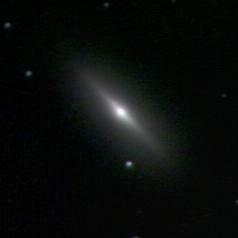 Apart from its usual designation of NGC 3115, the Spindle Galaxy was also listed by Sir Patrick Moore in his 1995 Caldwell Catalogue as entry number 53 (C53). NGC 3115 should not be confused with another galaxy, NGC 5866 (M102) in the constellation of Draco, the Dragon, which is also known as the Spindle Galaxy. Coma Berenices (Berenice's Hair, named after the wife of Ptolemy III of Egypt, 3rd century BC) is a faint constellation with no star brighter than magnitude +4.3 but it has many faint stars visible through binoculars, particularly in its North-western quadrant (in particular, the Coma Star Cluster). Our Milky Way galaxy's North Pole lies in the direction of Coma Berenices. The constellation contains numerous faint, distant galaxies. One of the brighter examples is the Black Eye Galaxy (M64 or NGC 4826), so-named because of a curved dark dust lane which is positioned to one side of its bright central nucleus. This feature does however need a telescope of at least 150 mm (6 in) aperture to be discerned. Under the darkest skies, binoculars will detect the galaxy as a small, faint, slightly elliptical patch of nebulosity. The galaxy measures about 6' x 3', has an integrated magnitude of +8.5 and a surface brightness of +12.6. In larger telescopes, the nebulosity is seen to extend much further away from the galaxy's nucleus. The Black Eye Galaxy is a Seyfert galaxy with an Sb classification (a 'barred spiral') or, more accurately, (R)SA(rs)ab, HIISy2 (!) Astronomers believe that the dark dust lane is a consequence of the galaxy having collided with a passing satellite galaxy at some time in the distant past, the smaller galaxy having been absorbed into the larger. Peculiarly, the galaxy's outer regions rotate in the opposite direction to its inner regions, providing support to the 'collision/absorption' theory. The Black Eye Galaxy is about 24 million light years distant and spans some 65,000 light years across. Also in Coma Berenices, residing amongst the sprinkling of stars of the aforementioned Coma Star Cluster, is the galaxy NGC 4494. With an integrated magnitude of +9.9 and a surface brightness of +13, it is rather too faint for binoculars, but small telescopes will show a circular patch of nebulosity with a brighter core. In larger telescopes the nucleus begins to appear stellar, the halo being slightly elongated North-South. M53 (NGC 5024) is the brightest of three globular clusters in Coma Berenices which are within the range of amateur telescopes. Globular clusters are dense concentrations of stars, all of which are about the same age and chemical composition. The number of stars in a globular cluster can lie anywhere between 10,000 and several million and they are amongst the oldest objects in the universe, being perhaps 10 billion years old. Positioned about 1° to the North-east of the constellation's second-brightest star Diadem ( Com or Alpha Comae Berenicis, mag. +4.3) M53 has an integrated magnitude of +7.5, making it easy to see through binoculars under dark skies. Its apparent diameter is about 13' but it only appears about 3' wide through smaller instruments. It appears as a circular, hazy patch of light with a distinct central core. Telescopes of at least 150 mm (6 in) aperture and high magnifications (over 200x) are required to resolve the centre into individual stars, which are about 11th-magnitude. Through larger instruments (250 mm/10 in aperture or higher) the globular extends to about 12' and the outer regions of the cluster are resolved into stars. M53 is situated about 58,000 light years from Earth, making it one of the more distant globular clusters known in the Milky Way galaxy. The Whale Galaxy (NGC 4631) in Canes Venatici, complete with flipper and fluke. The dwarf elliptical galaxy NGC 4627 is visible just above the main galaxy (Image: GALEX / NASA / Wikimedia Commons). Across the border to the North-east, in the constellation of Canes Venatici, the Hunting Dogs, is another globular cluster, M3 (NGC 5272). It is bright but less easy to find with telescopes than M53. 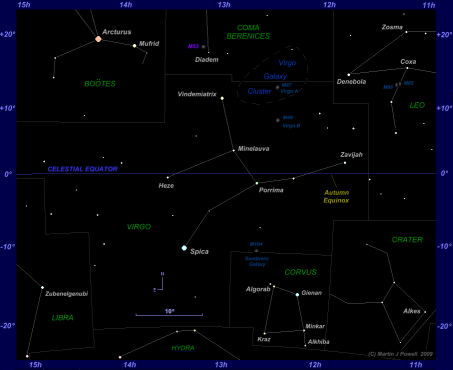 The best technique for telescope users is to aim the finderscope to a position roughly mid-way between Arcturus (in Boötes) and the star Cor Caroli ( CVn or Alpha Canum Venaticorum, not shown on the star chart). As a final guide, a 5th-magnitude star is positioned 1°.5 to the South-west of the cluster. With an integrated magnitude of +6.4 and an apparent diameter of 16', M53 is one of the largest and brightest globular clusters in the Northern hemisphere sky. Through binoculars and small telescopes it appears as a hazy, oval-shaped halo, telescopes showing some granularity at low magnifications. In telescopes of 100 mm (4 in) or higher aperture, the stars in the cluster's outer regions become resolvable. The central core appears somewhat rectangular and slightly off-centre, with curved radial chains of stars emanating from it. M3 is 33,900 light years away and is estimated to contain about half a million stars. 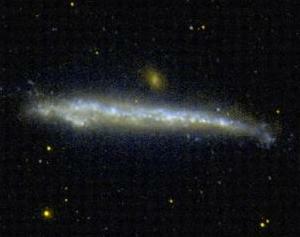 Also in Canes Venatici is the edge-on galaxy NGC 4631, sometimes called the Whale Galaxy. Although not particularly bright, it is worthwhile tracking down because of its unusual, asymmetric appearance. Its dimensions are 15' x 3' and its integrated magnitude +9.2, giving a surface brightness of +13.3. Through telescopes, the galaxy is orientated East-West and has numerous irregular knots and bright spots across its length. The Western end tapers to a point whilst the Eastern end appears rather more rounded, giving it an uncanny resemblance to the giant marine mammal after which it is named. The Whale Galaxy is around 30 million light years distant and is listed as number 32 (C32) in Sir Patrick Moore's Caldwell Catalogue. Just 2'.7 to the North-west of Whale Galaxy is another galaxy, NGC 4627. It is much smaller and fainter than NGC 4631 and requires telescopes of at least 250 mm (10 in) aperture to detect. Hydra, the Water Snake, is the largest constellation in the sky, covering an area of 1,303 square degrees, though only its Northern section is shown on the star chart. Hydra winds its way across the sky, through 95° of celestial longitude, starting just South of Cancer and passing between no less than ten constellations before 'tailing off' just to the South of Libra. Hydra's brightest stars are all found in its Northern half. Alphard ( Hya or Alpha Hydrae, mag. +2.0), also spelled Alfard, is the constellation's brightest star whose isolated position draws attention to an otherwise barren region of the night sky - indeed, its name means 'the solitary one'. Being positioned at the heart of the Water Snake, it has also been known by the name Cor Hydrae. Alphard is an orange giant star 175 light years from Earth. It is the only star in the constellation which shines brighter than magnitude +3.0. 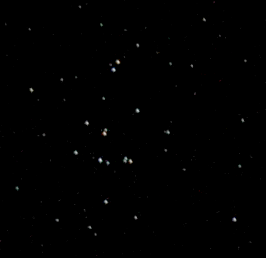 Open Star Cluster M48 (NGC 2548) in the constellation of Hydra. Note the brighter stars forming an alignment along the cluster's centre (Image: Ole Nielsen / Wikimedia Commons). Hydra's most recognisable feature is its distinctive 'snake head' asterism. At the top of the snake's head is the double star Hya (Epsilon Hydrae) with yellow and blue components of mag. +3.4 and +6.9 respectively. This is one of the more colorful double stars in the night sky, and although the separation between the two components is just 2".7 - making it resolvable only in telescopes of at least 75 mm (3 in) aperture at high magnification - the contrasting colours make it a delight to observe. Epsilon Hydrae is about 135 light years distant, the secondary star orbiting the primary once every 1,000 years or so. Positioned North of Alphard and a short distance to the West of the star Hya (Iota Hydrae, mag. +3.9) is the double star 1 Hya (Tau 1 Hydrae). It is a wide pair (66") of mags. +4.6 and +7.2, the fainter star being positioned to the North of the brighter star. About 1°.7 to the NNE of Tau 1 Hydrae is 2 Hya (Tau 2 Hydrae, mag. +4.5). Although the labelling of these two stars might suggest they are in some way connected, they are very different star systems, 1 Hya being 56 light years distant from Earth whilst 2 Hya is 460 light years distant. The two stars were originally labelled (and therefore associated with each other) by the Greek mathematician and astronomer Claudius Ptolemy (ca. 90 AD - ca. 168 AD) in his famous Almagest star catalogue, in which he described them as being two "of the three [stars] which are on the bending of the neck [of the Hydra]". 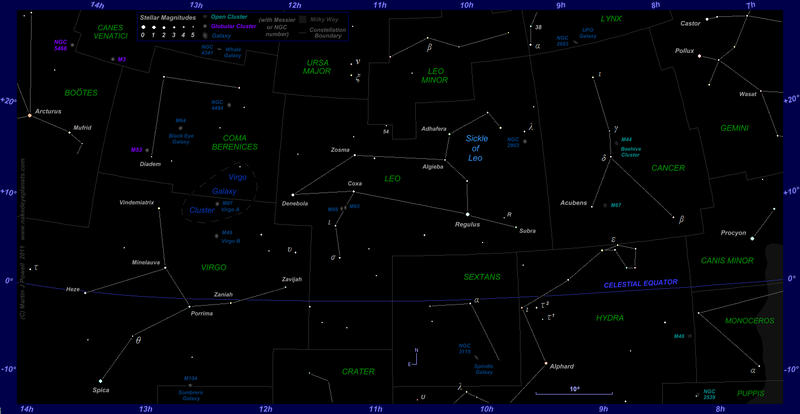 Close to the lower border of the star chart is the variable star U Hydrae, which fluctuates in brightness between mags. +4.7 and +6.2 at irregular intervals. It is a carbon star noted for its deep red coloration; in fact, it is one of the reddest stars in the night sky. Visually, U Hydrae forms a neat equilateral triangle with the stars Hya and Hya (both of which are just outside the star chart coverage). Close to Hydra's Western border with Monoceros is the open cluster M48 (NGC 2548) which is a pretty sight for binocular and small telescope users. The integrated magnitude is about +5.5, making it just visible to the naked-eye under dark skies. Small aperture telescopes will show about 60 stars within an area of sky about 40' across (greater than the apparent size of the Full Moon). Numerous bright stars and binary stars occupy the centre of the cluster in a North-South alignment. Telescopes reveal several yellowish stars along with mostly white ones, some of them double. More stars are revealed with increasing telescope aperture; a 30 cm (12 in) telescope, for example, will reveal at least 100 stars across an area of about 50'. The cluster is about 2,000 light years from Earth. When French astronomer Charles Messier published his famous catalogue of non-stellar objects in 1771 (in order to distinguish them from comets) he erroneously listed the declination of Messier 48 to be on the celestial equator, some 5° to the North of its correct position, although the Right Ascension (celestial longitude) he gave for the cluster was correct. Because of the confusion arising from this, credit for the discovery has sometimes been given to the British astronomer Caroline Herschel, who first noted the cluster in 1783. Hydra should not be confused with Hydrus, the Lesser Water Snake, a much smaller constellation which lies near the Southern Celestial Pole. Puppis, the Poop, is a Southern hemisphere constellation which is rich in deep-sky objects. It represents the poop (the raised stern section) of the ship named Argo Navis which, in Greek mythology, was captained by Jason to carry his 50-strong crew in search of the Golden Fleece. The Milky Way runs through the constellation, which is the reason why its most numerous deep-sky objects are open star clusters. Puppis lies between declinations -11° and -40° (i.e. between 11° and 40° South of the celestial equator), so that it is only fully visible South of latitude 50° North. At higher latitudes, the Southern section of the constellation is always below the horizon, even when the constellation reaches its highest point above the local horizon at meridian transit. One open cluster situated in the Northern region of Puppis (at declination = -12°.8) and close to the border with Monoceros is NGC 2539. Its integrated magnitude is about +6.5 and it contains about 130 stars within an area of about 25 arcminutes. Through telescopes, the cluster has an irregular edge and there are about three stellar concentrations of stars of about 10th magnitude and fainter. Through binoculars the cluster is a faint and difficult hazy patch of light. Leo Minor (the Little Lion or Lion Cub), situated between Leo itself and Ursa Major, is fainter even than Cancer. It contains no stars brighter than magnitude +3.8 and there are no deep-sky objects to view in moderate-sized telescopes or binoculars. Because of a 19th century error when assigning star labels, this constellation has no star named Alpha ( ) Leonis Minoris, although this should technically have been assigned to its brightest star, 46 Leonis Minoris. Lynx, like Leo Minor, is a relatively recent constellation, having been introduced in the 17th-century by the Polish astronomer Johannes Hevelius. It bears no resemblance to a lynx and was in fact so-named because, as Hevelius put it, "only the lynx-eyed would be able to see it"! Lynx contains numerous double stars and multiple stars of interest to the amateur observer; there are numerous double stars, some interesting (but faint) galaxies and a very distant (and faint) globular cluster. About 2°.4 North of Lynx's brightest star Lyn (Alpha Lyncis, mag. +3.1) is the double star 38 Lyncis. It is a bright but difficult double owing to the tight separation of its mag. +3.9 and +6.2 components. The sixth-magnitude secondary star is positioned just 2".7 to the South-west of the primary, requiring at least a medium-sized telescope aperture to split them with ease. There is also a third star in the system, of magnitude +10.8, some 88" away, also to the South-west of the primary. NGC 2683, near Lynx's Southern boundary with Cancer, is the brightest example of the constellation's seventeen or so galaxies which are visible through amateur telescopes. In long-exposure photographs, its shape is reminiscent of a classic 'disk-shaped' UFO, hence its alternative name of UFO Galaxy. Measuring 9' x 2' on the sky, it is a rather faint edge-on galaxy with an integrated magnitude of +9.7 and a surface brightness of +12.9. NGC 2683 is elongated NE-SW and some dusty features can be glimpsed through larger aperture telescopes. Ursa Major, the Great Bear, is a large and very well-known constellation which contains the asterism commonly called The Big Dipper (in the USA and Canada) or The Plough (in the UK and Ireland). Only the Southernmost section of the constellation appears on the star chart, where the stars Alula Australis ( UMa or Xi Ursae Majoris) and Alula Borealis ( UMa or Nu Ursae Majoris) are marked. These attractively-named stars are only 1°.6 apart in the night sky and they mark the foot of the Great Bear. Both stars are multiple systems, unrelated to each other. Alula Australis comprises two yellow components of mags. +4.3 and +4.8 (both of which are spectroscopic binaries), separable only in 75 mm (3 in) or larger aperture telescopes. The secondary star ( UMa B) orbits the primary ( UMa A) in a relatively short period of 60 years and they came closest to each other (0".8) in 1995, when telescopic apertures of 150 mm (6 in) or more were required to split them. In 2011 the secondary star was positioned 1".6 to the SSW of the primary; by 2020 it will have moved to the SSE of the primary and will be 2".1 distant from it. Alula Australis is a relatively close 27 light years from Earth and it was the first double star to be discovered (by Sir William Herschel in 1780). It was also the first to have its orbit computed (by Félix Savary in 1828). The components of Alula Borealis are orange and greenish, of mags. +3.5 and +10.1 respectively. The secondary star is positioned 7".2 to the South-east of the primary - another test for a 75 mm (3 in) telescope. At 421 light years from Earth, Alula Borealis is fifteen times more distant than its Southern counterpart. Alula Borealis B is so far away from the primary star (around 950 AU) that it takes at least 12,000 years to complete an orbit. As viewed from the Earth, the orbital motion of Alula Borealis B is so slow that the apparent separation and relative position of the two stars are essentially 'fixed'. Positioned to the South and West of Canis Minor is the constellation of Monoceros, the Unicorn; only its Eastern half is shown on the star map. The constellation's brightest star Alpha Monocerotis ( Mon, mag. +3.9) is an orange giant positioned some 180 light years distant. Interesting objects contained within the North-western section of the constellation are described on the Aries-Taurus-Gemini page. Finally, Boötes contains numerous interesting double stars and multiple stars, although only one of them appears within the area of the star map. 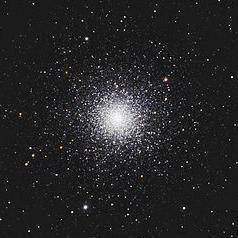 NGC 5466 is a globular cluster measuring 11' across and has an integrated magnitude of +9.0. Too faint for binoculars, small telescopes show it as a faint, hazy patch about 5' across whilst large telescopes show it extending to about 7' with a slight East-West elongation. NGC 5466 is rather less condensed than most globulars and a 250 mm (10 in) aperture telescope is required to resolve the cluster's outer stars. The star chart was created using the commercial software MegaStar by Willmann-Bell, Inc. Star colours were based on those shown in "Patrick Moore's Colour Star Atlas" by Patrick Moore (Mitchell Beazley Publishers Ltd., London, 1973). A previous version of the star map originally appeared in an article by the writer entitled 'The Position of Mars in the Night Sky: 2011 to 2012'. Useful sources of information include "The Guinness Book of Astronomy Facts and Feats" by Patrick Moore (Guinness Superlatives Ltd., Enfield, 1983), "Norton's 2000.0" edited by Ian Ridpath (Longman Group UK Ltd., Harlow, 1989), "Constellations: A Concise Guide in Colour" by Josef Klepeštra and Antonin Rükl (Paul Hamlyn, London, 1969), "Collins Guide to Stars and Planets" by Ian Ridpath and Wil Tirion (William Collins Sons & Co. Ltd., London, 1988), "The Observer's Sky Atlas" by E. Karkoschka (Springer-Verlag, New York, Inc., 1998), "Observing the Constellations" by John Sanford (Mitchell Beazley Publishers, London, 1989), "Astronomy with Binoculars" by James Muirden (Faber & Faber Ltd, London, 1976), "Observing Handbook and Catalogue of Deep-Sky Objects" by Christian B. Luginbuhl and Brian A. Skiff (Cambridge University Press, Cambridge, 1990) and "Universe - The Definitive Visual Guide" by Martin Rees (ed) (Dorling Kindersley Ltd., London, 2005). Ancient and historical information regarding the zodiac constellations were obtained from the books "The Origin of the Zodiac" by Rupert Gleadow (Jonathan Cape, London, 1968), "Dictionary of Astronomical Names" by Adrian Room (Routledge, London and New York, 1988) and "Origins of the ancient constellations: I. The Mesopotamian traditions" by John H. Rogers in "Journal of the British Astronomical Association", Vol. 108, No. 1 (February 1998), pgs. 9-28.